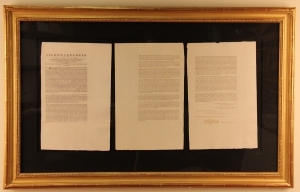 The first Patent Act was passed by Congress on April 10, 1790. It gave complete power to grant patents to a board consisting of the Secretary of State, the Secretary of War and the Attorney General. As Secretary of State, Thomas Jefferson personally examined all applications. “He was now able to keep his finger on the pulse of American discovery,” Jefferson biographer Dumas Malone observed. “No compatriot of his was so well fitted to enjoy and fill such a position.” Only 57 patents were granted during Jefferson’s tenure, in part because of his strict interpretation of the requirement for originality and practicality. It wasn’t long, however, before Jefferson and the other board members realized thatmore pressing duties left them with insufficient time to assess the applications. 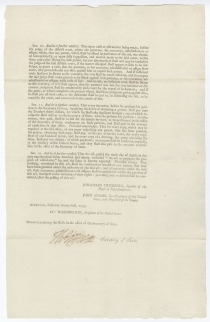 This 1793 Patent Act specifically addresses the problem, charging the Secretary of State with issuing a patent to any applicant who complied with a set of prescribed formalities, swore his invention was original, and paid a fee. Also, through Jefferson’s private influence, it broadened the wording to include any “new and useful improvement” to an existing product, a definition that remains to this day. To reduce the Patent Board’s responsibility, however, the 1793 Act left any claims of the novelty and validity of an invention for the courts to decide. This system remained in effect for more than 40 years, by which time patents—many of them for inventions that were not original—were being issued at a rate of 600 per year. To stem the tide of derivative and useless inventions, a revised act was passed in 1836, which returned to the practice of examining an application before the issue of a patent. Following a law passed on September 15, 1789, Thomas Jefferson, as Secretary of State, signed two copies of each law, order, vote, or resolution of Congress for distribution to the executive of every state. 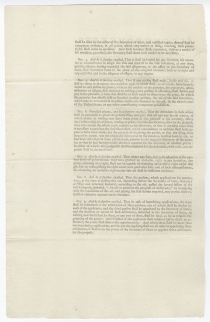 (By the same law, a single copy was distributed to each U.S. senator and representative, though these did not require Jefferson’s authentication. Surviving copies are unsigned and printed on much smaller paper.) As there were 15 states at the time this act was passed, it is likely that just 30 copies were signed by Jefferson. 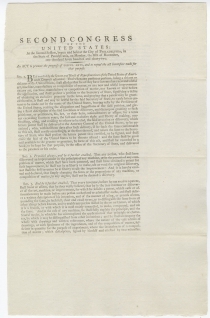 After checking WorldCat and OCLC FirstSearch, as well as catalogs for the American Antiquarian Society, American Philosophical Society, Huntington Library, Rosenbach Museum and Library, and Library of Congress, we have located no other signed copies of this act or of its predecessor, the 1790 Patent Act. We find no record of either one appearing at auction for at least the last 25 years.